SearchMyFiles Utility - You can use the Duplicate Search Mode in this utility for finding duplicate files on your system. This utility works on Windows 2000/XP/2003/Vista/Windows 7/Windows 8/Windows 10. Older versions of Windows are not supported. Fixed bug: HashMyFiles failed to remember the last size/position of the properties window if it was not located in the primary monitor. The Copy MD5/SHA1/SHA256 options now work with multiple selected items. Added 'Open Folder In Explorer' option. Added 'Entry Modified Time' column (Available only on Windows Vista or later with NTFS file system). Fixed bug: HashMyFiles created a csv file without header when using /SaveDirect command-line option with 'Add Header Line To CSV/Tab-Delimited File' option turned on. Fixed the 'Open In VirusTotal Web site' option to work properly when 'Show Hashes In Uppercase' option is turned on. Added new information to 'File Attributes' column: 'I' for 'Not Content Indexed', 'E' for encrypted file, 'X' for 'No Scrub File', and 'V' for 'Integrity Attribute'. Fixed bug: The 'Run As Administrator' option failed to work on some systems. Fixed bug: the extension column displayed a wrong value when the folder name had a dot character. Increased the size of bottom status bar to display long paths. Explorer context menu inside HashMyFiles: When you right-click on a single item while holding down the shift key, HashMyFiles now displays the context menu of Windows Explorer, instead of the HashMyFiles context menu. Added /SaveDirect command-line option for using with the other save command-line options (/scomma, /stab, /sxml, and so on...), which allows you to export the hashes directly to a file, instead of accumulating all hashes in memory and then save them to file in the end. Added 'Run As Administrator' option (Ctrl+F11). Fixed the 'Open In VirusTotal Web Site' option to work properly with MD5 hash when there is no SHA256 hash. Fixed bug: HashMyFiles failed to remember the last size/position of the main window if it was not located in the primary monitor. Added option to add 'Open In VirusTotal Web Site' to the context menu of Windows explorer. When right-clicking on a file in Windows Explorer and choosing 'Open In VirusTotal Web Site', HashMyFiles calculates the hash of this file and then opens it in VirusTotal Web site. Added /virustotal command-line option, which calculates the hash of the specified file and then opens it in VirusTotal Web site. Fixed HashMyFiles to handle daylight saving time properly, like Explorer on Windows 7. If SHA256 hash is not active, 'Open In VirusTotal Web site' option now works with MD5 hashes. If you have a software file that other people already submitted to VirusTotal, this option will open a Web page in VirusTotal Web site with the Antivirus scanning result. Fixed bug: HashMyFiles displayed hashes for empty files, and marked them as identical to the string in the clipboard. Fixed the flickering while scrolling the hash list. When selecting one or more files located on a remote network and choosing 'Move To Recycle Bin', HashMyFiles now asks you whether you want to delete the files, because remote network files cannot be sent to Recycle Bin. When HashMyFiles asks you whether to delete files or move them to Recycle Bin, the default answer is now set to 'No'. Accelerator keys change: Del key is now used for 'Remove Selected Files' option. Fixed bug: HashMyFiles failed to detect identical files properly if the user unchecked the MD5, SHA1, and CRC32 hash types. Fixed bug: HashMyFiles didn't display any hash if the user unchecked the MD5, SHA1, and CRC32 hash types. Fixed the 'Mark Hash In Clipboard' option to work with CRC32. Fixed bug: The 'Mark Hash In Clipboard' option failed to work with the SHA-256, SHA-512, and SHA-384 hashes. Fixed bug: HashMyFiles failed to display the size and date/time information for a filename that begins with dot character. Added 'CRC32 Display Mode' - Hexadecimal or Decimal. Added support for SHA-256 and SHA-512 hashes. These hashes are supported on Windows XP/SP3, Windows Vista, Windows 7, Windows Server 2003, and Windows Server 2008. You can now drag one or more files from the window of HashMyFiles into Explorer window or other application. Added 'Remove Selected Files' (Ctrl+R), which remove the selected files from the list of hashes. 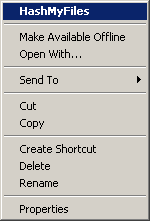 Added 'Copy CRC32' to the context menu. In 'Add By Wildcard' window, the browse button now works properly. Added 'Add By Wildcard' option (F6), which allows you to add multiple files by specifying wildcard and subfolder depth. Added /wildcard command-line option for using the new 'Add By Wildcard' option from command-line. Fixed bug: Export to .csv files didn't work well if one of the values contained comma characters. Added 'Move To Recycle Bin' option. Fixed missing icons problem in Windows7/x64. Added 'Delete Selected Files' option, which allows you to easily delete duplicated files. Fixed bug: Modified Time and Created Time displayed the same date/time. Fixed bug: Save command-line options failed to work in the last release. Fixed issue: When HashMyFiles window is hidden and there is an icon in the taskbar, running HashMyFiles again will open the existing instance of HashMyFiles, instead of creating another one. Added 'Put Icon In Tray' option. When you specify empty string ("") in the /folder command-line option, HashMyFiles will now use the current folder. Fixed bug: 'Mark Hash In Clipboard' option marked all hashes when one or more hash types were deselected. Added 'Hash Types' sub-menu under options. Allows you to select which types of hashes you want to calculate. Fixed bug: When dragging a file into HashMyFiles window while it's already processed by HashMyFiles, the file was added multiple times. Fixed bug: When 'Add files in subfolders' was selected, only sub-folders files were added. Added new option: 'Add files in subfolders'. 'Select Process' dialog-box is now resizable. Added support for adding multiple files in 'Add File' option. Fixed bug: The main window lost the focus when the user switched to another application and then returned back to HashMyFiles. Display single file progress information (in percent) while hashing large files. 'Mark Identical Hashes' option - now also works with saved HTML files and HTML reports. Add 'Mark Identical Hashes' option - Mark identical hashes with up to 8 different colors. Fixed bug: When using 'Add Process Files' option, the filenames displayed in short path format. Fixed bug in Unicode version: wrong characters added to clipboard copy option. Added 'Mark Hash In Clipboard' option. If this options is selected, the hash that you copy to the clipboard is compared to the MD5/SHA1 hashes that are currently displayed in HashMyFiles. If there is a match, the hash line is marked in green color. Added 'FF FE' characters in the beginning of the saved Unicode files (Unicode version only). Fixed bug: HashMyFiles remained in memory if you closed it while calculating hashes. New option: 'Add Process Files' - Allows you to get the hashes of all DLL files of the selected process. Explorer Context Menu - If an instance of HashMyFiles is already running, the selected files will be added to the existing instance, instead of creating a new one. File icons are now displayed according to the file type. New option: Always On Top. Added 'Stop' menu item while calculating the hashes. Added new columns: Modified Time, Created Time, and File Size. /file <Filename | Folder | Wildcard> Specifies the filename, folder, or wildcard that you want to hash. /files <Filename> <Filename> <Filename> ... Specify multiple filenames, folders, or wildcards that you want to hash. /folder <Folder> Specifies a folder and all its subfolders. /wildcard <Full Path Wildcard> <Subfolder Depth> Specifies wildcard with full path (e.g: c:\folder\*.exe) and the depth of subfolders to scan. For <Subfolder Depth> parameter: 0 = no subfolders, 1 = one level of subfolders, 2 = two level of subfolders, and so on... 1000 = Infinite number of subfolders. /virustotal <Filename> Calculates the hash of the specified file and then opens it in VirusTotal Web site. /stext <Filename> Save the hashes list into a regular text file. /stab <Filename> Save the hashes list into a tab-delimited text file. /stabular <Filename> Save the hashes list into a tabular text file. /shtml <Filename> Save the hashes list into HTML file (Horizontal). /sverhtml <Filename> Save the hashes list into HTML file (Vertical). /sxml <Filename> Save the hashes list to XML file. /scomma <Filename> Save the hashes list to comma-delimited file. /sort <column> This command-line option can be used with other save options for sorting by the desired column. If you don't specify this option, the list is sorted according to the last sort that you made from the user interface. The <column> parameter can specify the column index (0 for the first column, 1 for the second column, and so on) or the name of the column, like "Filename" and "Identical". You can specify the '~' prefix character (e.g: "~Identical") if you want to sort in descending order. You can put multiple /sort in the command-line if you want to sort by multiple columns. /SaveDirect Save the hashes list in SaveDirect mode. For using with the other save command-line options ( /scomma, /stab, /sxml, and so on...) When you use the SaveDirect mode, the hash lines are saved directly to the disk, without loading them into the memory first. This means that you can save a list with large amount of hashes into your disk without any memory problem, as long as you have enough disk space to store the saved file. The drawback of this mode: You cannot sort the lines according to the column you choose with /sort command-line option. HashMyFiles.exe /file "c:\temp\*.zip" /shtml "c:\temp\1.html"
HashMyFiles.exe /file "d:\temp\myfile.zip" /stab "d:\temp\myfile.txt"
HashMyFiles.exe /files "c:\temp\*.zip" "c:\temp\1234.exe" "c:\temp\Hello.exe" /shtml "c:\temp\1.html"
HashMyFiles.exe /folder "c:\temp" /shtml "c:\temp\1.html"
HashMyFiles.exe /folder "c:\temp" /shtml "c:\temp\1.html" /sort "Identical" /sort "Filename"
HashMyFiles.exe /wildcard "c:\temp\*.zip" 1 /shtml "c:\temp\1.html"
HashMyFiles.exe /SaveDirect /folder "c:\temp" /scomma "c:\temp\1.csv"
A file named HashMyFiles_lng.ini will be created in the folder of HashMyFiles utility. After you finish the translation, Run HashMyFiles, and all translated strings will be loaded from the language file. If you want to run HashMyFiles without the translation, simply rename the language file, or move it to another folder.